The much-awaited trailer of Kalank, starring Varun Dhawan, Alia Bhatt, Aditya Roy Kapur, Sonakshi Sinha, Madhuri Dixit and Sanjay Dutt, is out. The makers released the teaser of the film a few weeks ago and have since released videos of the film’s songs, “Ghar More Pardesiya”, “First Class” and the film’s title track. Directed by Abhishek Varman, who has earlier helmed 2 States, Kalank is set in the 1940s and from what the audience can gauge from the videos released so far, the film’s plot revolves around forbidden love. With Kalank, Madhuri Dixit and Sanjay Dutt will be reuniting on the silver screen after 1997’s Mahaanta. The two have worked in popular films like Saajan, Thanedaar and Khalnayak among others. The much-loved duo Alia Bhatt and Varun Dhawan also reunite after successful films like Humpty Sharma Ki Dulhania and Badrinath Ki Dulhania. The two also made their film debut together with Student of the Year. Madhuri Dixit plays Bahaar Begum in the film and the role was initially supposed to be played by Sridevi. After her untimely demise in February 2018, Madhuri Dixit stepped in. 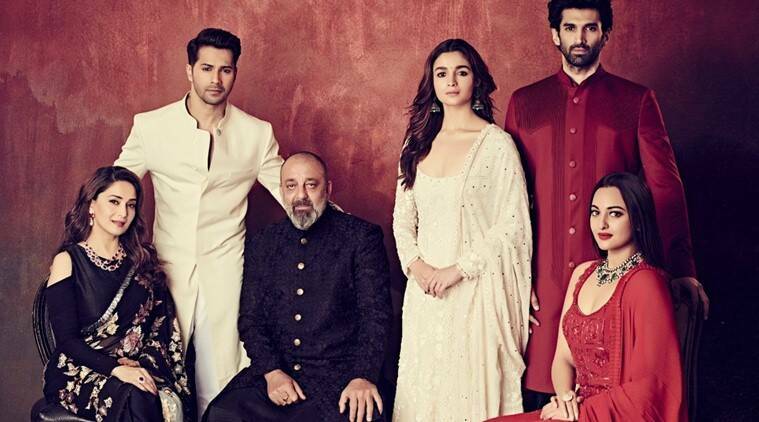 Kalank has already made waves with regard to its grand sets and its stellar cast. The film releases on April 17. Follow all the latest updates about Kalank. The film certainly has the hangover of a Sanjay Leela Bhansali costume drama but it is yet to be seen how this inspiration translates on screen. Overall, Kalank is a film with quite a lot of characters and it looks like they will all have a pivotal part in taking the story forward. "There are many twists and turns in this film. There are so many moments about different relationships and that phase in history. So we don't want to give it all out. 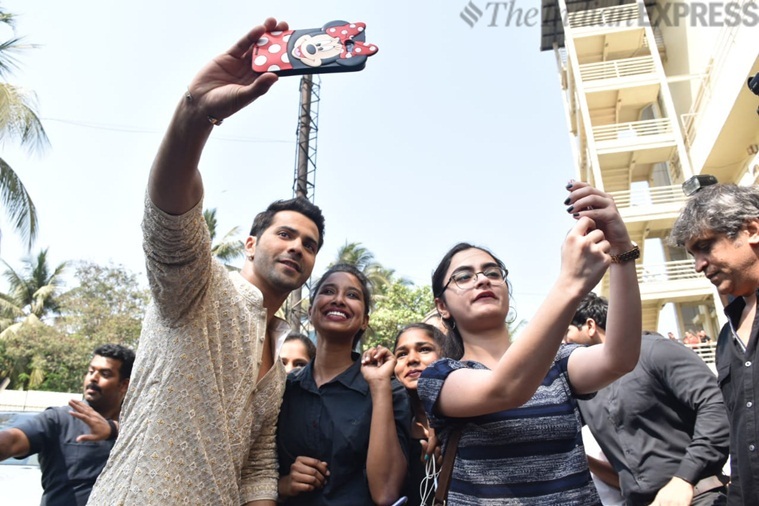 You all should watch it on screen when the film releases," says Varun Dhawan. "This role is important and doing this film is a turning point in my life. It is special for my career. The lady I am playing is someone who wants to keep her home safe and her family together," says Sonakshi Sinha. "It was fate. We were meant to work together. All these actors are great at what they do. Sanjay sir has always been great. These characters are really grounded and have great back stories. The kind of experiences they have had, and the way the lives of all these characters are intertwined is really interesting," says Madhuri Dixit. "Since it is a period film, I was not sure how I would identify with Zafar. I used to ask Abhishek what must have happened to Zafar in his childhood that he has turned out the way he has. He is a little arrogant in the film," says Varun Dhawan. "It was a time when Karan Johar was supposed to direct this film, and the cast was totally different. But when this story was given to Abhishek to direct, it became different," says Varun Dhawan. "At the core, Kalank is about human dynamics," says Alia Bhatt. "Abhishek Varman is a very good director. He is very soft. I love the scene between Varun, Madhuri and myself. It's a powerful scene. I loved shooting for the film," says Sanjay Dutt. "Alia Bhatt has become a big actor now, and may not have dates to work with us in the future (Referring to his joke from Filmfare awards)," says Varun Dhawan. "Mai toh Kalank hi hun. Maine kuch kalank kamaaye hain. Kuch kalank thope gayein hain. All of then have been washed away I feel," says Sanjay Dutt. "Alia Bhatt and I were nervous when we were shooting the song. We both were supposed to sing a sargam together, and it was quite long. We both were finding a short cut to do it," says Madhuri Dixit. "I am a part of such an amazing cast. I have grown up watching Sanjay sir and Madhuri sir. And we have Varun, who has grown up watching my work (laughs). It will be a great film. I am waiting to watch it," says Kunal Khemu. Aditya Roy Kapur is late! Aditya Roy Kapur is yet to arrive. Varun Dhawan jokes that this would be Sonakshi Sinha's first and last film with Aditya because he is late. "This is my first film with Aditya Roy Kapur. It was a great experience. Everybody related to this film is great. All the actors are exceptionally talented," says Sonakshi Sinha. Alia is "Roop ki Mallika"
At the trailer launch of Kalank, Varun Dhawan introduces Alia Bhatt as "Roop ki Mallika". Actors Varun Dhawan and Alia Bhatt are hosting Kalank trailer launch. Indianexpress.com's Komal says, "The trailer looks quite impressive. The camera work, the richness and vastness of the sets, and the costumes totally stand out. The story looks more intriguing than we thought after watching the teaser. Varun, Aditya and Sonakshi look totally in their characters." Dharma Productions wrote on Twitter, "Some stories will make your heart swoon. Some will leave you wanting more. Stay tuned, #KalankTrailer out TODAY! @duttsanjay #AdityaRoyKapur @Varun_dvn @aliaa08 @sonakshisinha @MadhuriDixit @abhivarman @ipritamofficial #ArijitSingh @OfficialAMITABH #Kalank"
Alia Bhatt posted on Twitter, "Kalank trailer today! 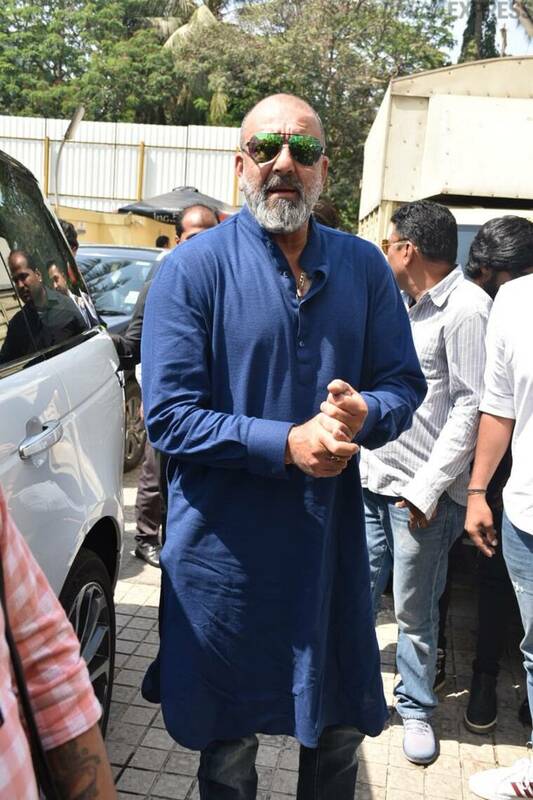 #Kalank @duttsanjay #AdityaRoyKapur @Varun_dvn @sonakshisinha @MadhuriDixit @abhivarman"
While sharing the first look of Alia Bhatt and Varun Dhawan, Karan Johar had shared on social media that Kalank was the last film his father Yash Johar worked on. Karan wrote, "A film that was born in my heart and mind 15 years ago....a film I passionately believe in...the last film my father worked on before he left us....it was his dream to see this film come through....I couldn’t fulfil his dream then....my spirit was broken....but today his wish has found a relationship with celluloid....the story of turbulent relationships and eternal love has found a voice....the film has been woven,nurtured and visualised by ABHISHEK VARMAN....and the film Is KALANK! Set in the 40’s but it’s heart lives on.....TOMORROW the journey begins.....am excited ...anxious and emotional about this one...I do hope you join us on our path to undying love.....#KALANK"
The film's crew also includes cinematographer Binod Pradhan, music director Pritam and lyricist Amitabh Bhattacharya. Kalank is co-produced by Fox Star Studios, Dharma Productions and Nadiadwala Grandson Entertainment.